Aren’t crappy cymbals one of the most discouraging things about being a drum beginner or drummer on a budget? You can tune your drum heads very easily and make even the cheapest kit sound fairly good. But the cymbals are just there. You either hit them and they sound great – or they don’t. And each new drum set (except for electronic ones) comes either with low-quality cymbals or with no cymbals at all. So there’s no way around buying some. But what is the best budget cymbal pack? And how can you determine that if taste is so subjective? Well, cymbals are made through different processes and they are made from different kinds of material. Both those things are quite complex. Fortunately for you, I dove deep into the world of alloy and hammering – and I’ve made it back to the surface. 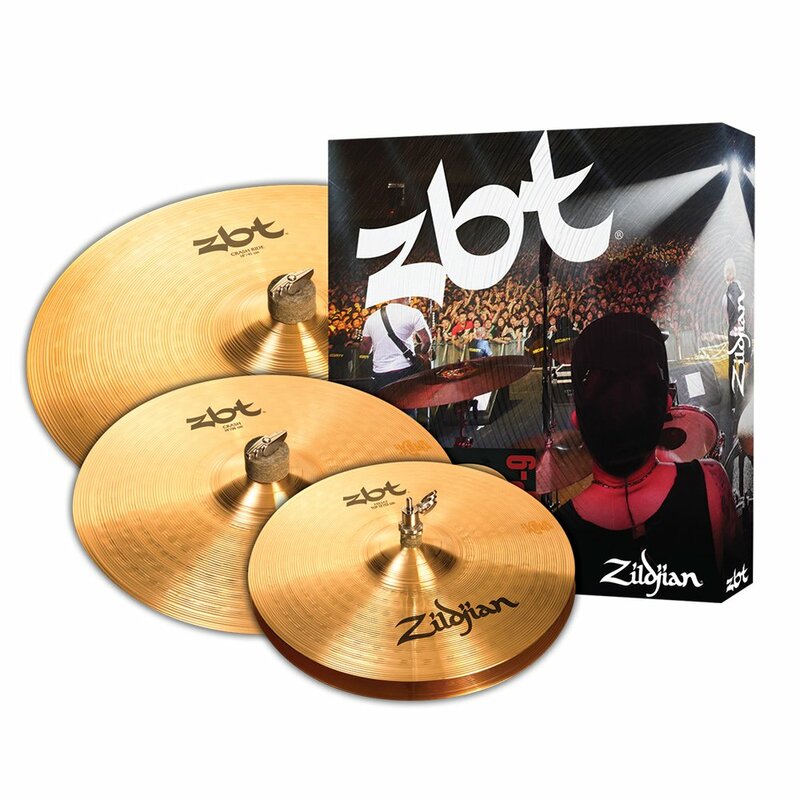 Zildjian is one of the best known cymbal manufacturer in the drumming world and their ZBT starter pack uses “Zildjian Bronze Technology”. That means these cymbals are made of B8 bronze, a mixture of 92% copper and 8% percent tin (hence the name). That’s a good thing, because bronze has better sound characteristics than brass, which is used in the stock cymbals that come with most beginner drum sets. At the same time, B8 bronze is generally cheaper than B20 (80% copper and 20% tin). This is why this Zildjian cymbal pack is fairly cheap, and it doesn’t even mean that the ZBTs sound bad. They simply sound different: brighter and more focused, because they have higher frequencies than B20 cymbals. So I think the Zildjian ZBT are cheap but good-sounding cymbals! What about you? Wuhan cymbals, as the name implies, are made in Wuhan, China. And if you now think about scrolling away, please bear with me for one more minute. Because manufacturing in China allows Wuhan to sell a hand-hammered cymbal pack in B20 bronze for the cheapest price in this review. And with B20 bronze, these cymbals will sound fuller and warmer (some people would also say “darker”) than the Zildjian ZBT Pros above. And hand-hammering is a manufacturing process that usually only high-end cymbals undergo. Budget cymbal packs are normally made by machines punching cymbals out of bronze sheets. With Wuhan you get the high-end process on a budget. Yet, this also means that no 2 Wuhan cymbals will sound exactly the same. And that could work in your favor or against you. So you should be ready to return a Wuhan cymbal pack and get a new one if the pack you got doesn’t suit your taste. Wuhan also gives you a free cymbal bag which can save you a great deal of carrying and your cymbals their life at the next gig. My verdict: the best budget cymbal pack on the market! Dream manufacture high-quality cymbals and don’t break this promise with respect to their beginner cymbal pack. That means the Dream Ignition pack are the most expensive cymbals in this review, but they are alos no less than revered in the drumming community. Better than the Zildjian ZBTs, they are hand-hammered out of B20 bronze – which is arguably the best material for cymbals. Comared with the Wuhans, that’s the same material and manufacturing process. And actually, the Dream Ignitions are also made in the same factory! Now, this isn’t fraud or anything. Wuhan and Dream are two separate companies and the particular Chinese factory must have been the one with the know-how and a good price. So what actually is the difference between Wuhan and Dream cymbals? Well, the Dream Ignitions cost more money and that goes into their quality control. So you don’t have to worry about one pair of cymbals sounding like thunder and the next one like rain. 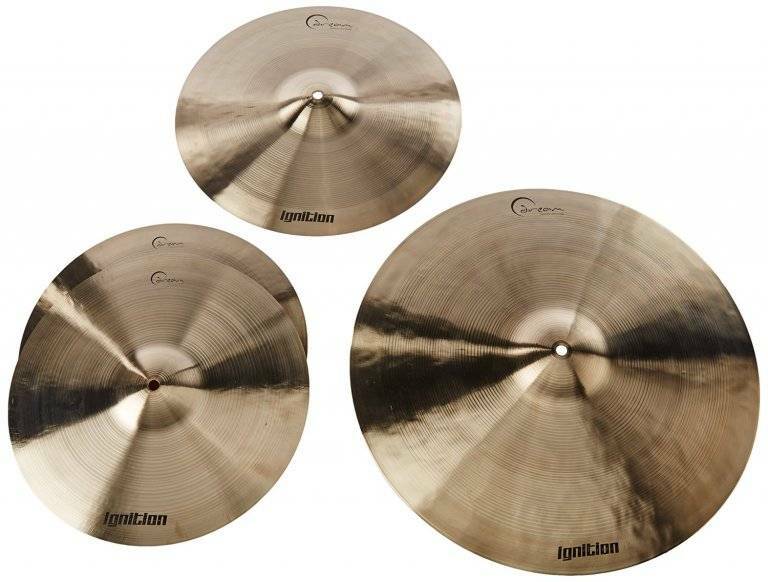 A nice final add-on: the Dream Ignition cymbal pack comes with a free bag for you to carry those beauties. My verdict: The best cymbal set in this review if you’re willing to spend the money. I know I’ve left out two (Meinl and Sabian) of the big three brands (+ Zildjian) in this best budget cymbal pack review. But I did so for a reason. Even despite the fact that both have incredibly cheap starter cymbal packs (the Sabian SBR and the Meinl HCS). Because although cheap might be appealing, you’ll end up paying more with these packs in the long run. With the Meinl you’ll pay double, because you’ll get a 18” Crash / Ride and that’s slightly too small for a Ride in my opinion. Also, as Crash / Rides are thin enough to be a Crash but also thick enough to be a Ride, it’s fairly logical that they do both jobs only half well. Of course, Sabian and Meinl do have high-quality cymbal packs in all the right sizes too. But they start way above the Dream Ignitions, so you’re better off with my best budget cymbal packs above. If this best budget cymbal pack review was helpful to you, and IF you decide to buy cymbals, please consider using the links / buttons on this page. This way I’d receive a commission at absolutely no extra cost to you, and you’d reward me for the care and effort I put into testing, researching and writing. You can read all about my reviewing ethics in my affiliate disclosure. Thanks so much! Hi I looked the Wuhan Western Style Cymbals up on Walmart.com and they list the material as brass. Did they change or are there different models of Western Style? Well, Walmart uses “brass” in their product specification, because it’s the umbrella term for lots of alloys (including B20 bronze). But in the product description, Walmart also says that the Wuhan Western Style cymbals are made of B20 bronze. And that is the more specific and right term. I think the Wuhan’s sound better than the Dream cyms. Wuhan’s are the BEST value for your money. I am an advanced player and love the crashes, 16 & 18″! That’s nice to hear Jakk. I’m very satisfied with the Wuhan’s too! Yet, it needs to be said that Dream has got better quality control, so the sound you get with the Dream cymbals should be more consistent across production cycles. As for the sound itself, I like them both. But for those reading this: please watch the above videos yourself and judge based upon your sound preferences. For what I think sounds beautiful might just sound like rubbish to you (unlikely but not impossible). What do you think of the Meinl Classics Customs? I can but get a pack for $400. The 14 hi-hats, 16 inch crash, 18 inch crash, and 20-inch ride. I am only a beginning drummer, but picking up on it very quickly and love it. I want a set that will be good enough for me throughout my career. I had my heart set on the Paiste 2002s, but have been playing the Meinl side-by-side with the 2002s, and I think the difference in sound is negligible. I haven’t played this particular model (the Meinl Classics) myself, but from what I can gather from my online research they are doing a fine job for drummers of various musical styles. And 400 dollars is a good bit cheaper than currently on Amazon. Are you getting them used? I see no reason not to go for them. Particularly if you’ve already played and liked them. Are the Dream Bliss cymbals more expensive than the Dream ignition. I have played them both and like the Bliss the best. The 19 in crash ride I tried had a dark sound that reminded me of a K Zildjian and the tone varied from the edge to the centre of the cymbal. Is that normal for a good quality ride. Yes, tone differences are very normal for hand-hammered cymbals because their very difference to cheaper cymbals is that they are cut and hammered individually for each piece and not made in a machine. So it is very normal for different cymbals of the same series to sound slightly differently – and it is also very normal that one cymbal is capable of producing various sounds as you move from its center outward to the ridge. And yes, too, the Dream Bliss Ride is cheaper than the Ignition cymbal pack. That doesn’t mean one is better than the other as in this case you can’t really compare, because one is a cymbal pack and the other a stand-alone cymbal – and the latter are usually cheaper. You write great posts, thanks for all your help! Thanks, Jerome. Your words are highly appreciated! loved the reviews and were helpful although I wanted to know if you could suggest crash cymbals that would cost about $100? Thanks for this review, I have bookmarked it. Beginner here, I have what as you said are stock cymbals that I got with my Ludwig kit. There is a pair of hi hats and a crash-ride. I bought a crash (by Pluto, bronze material, cheap and awesome sound). So, I am looking for a cheap bronze made ride which is how I got here on your page. I am enticed by Wuhan but have heard that break soon. Is that true? They are holding up pretty well for me and other buyers have told me the same. So I can’t imagine that’s true. Hi! Thanks for the quick response. Well, I read it in a couple of online forums and a drummer I know confirmed that. But I think these were regarding crashes and not rides. I am glad with your response though. Makes me keener to check Wuhan out. Prob is I live in India. And drumming is rather an obscure hobby here haha so the gear is rare and expensive. Even Wuhan. Might have to go for a lesser known brand. Cool that you’re going to all that length, then, Prateek. Let me know how it goes with the Wuhan once you have them! Cymbal breakage is usually due to a drummer not knowing how to hit a cymbal properly. Some young hard-rock drummers pride themselves on being able to break a cymbal… but that just indicates their musical ignorance (ignorance in an “uneducated/unknowing” sense, not in a “stupid” sense). Drummers should love their cymbals, unless they are rich and buy them to be like The Who or other destructive musicians… Cymbals, even “cheap” ones, can last a good drummer almost a lifetime. I agree: playing with the intent of destroying cmybals is…well…destructive, I suppose – and you can certainly play even cheaper cymbals for a long time. Only, some of them don’t sounds as good as your ears might wish after a certain time of drumming. Hi great article! Was wondering how the Sabian xs20 set compares to the dream and wuhan? I’m looking for a new set and can get a 4 piece used sabian xs20 set for £200. In your experience is the dream and wuhan better? thanks. Thank you so much! As you’ll have read in the review, the Dream have become my absolute favorites. That said, I was a Sabian player for years and years before that – but with cymbals the case is fairly subjective and I haven’t found a better way to test if you like them going on Youtube and checking out the sound of the cymbals you’re pondering. So: you’ll find demonstrations of the Wuhan and Dream above and I’d encourage you to compare them with the Sabian XS20 here. Being a drummer for over 50 years I know that many drummers do not know how to play a crash-ride cymbal properly. It’s supposed to make two sounds not take the place of two cymbals. You ride the cymbal very near the edge. Turn your wrist slightly and let the shoulder of the drumstick hit the edge. You’ll get a crashing sound as the cymbal continues to vibrate like a ride. Two sounds from one cymbal. That’s a good thing to keep in mind, Paul! Thanks so much! Fair review. If I could go back in time I would start with secondhand paiste alpha hats and crash, then save for a matching alpha ride. For new the pst7 pack is great. Stagg dh and Furia are decent too, check em on YouTube. Thanks, John! I’ve played some Staggs myself, and like them! Thanks for sharing your experience! I just decided to be brave and buy new Sabian SR2 “renewed” cymbals on ebay, from video sound samples… ordered 21″ ride, 18″ crash and 14″ hats… holding my breath… hope my mystery cymbals turn out to be gems! I hope so – and am confident of that – too, Rochelle! I am still torn between the wuhans and the dream cymbals lol. I can probably afford both so which one gives a better sound for indie rock? I think both would similarly well for Indie Rock, since they both are made of B20 bronze and thus have a dark and rich sound spectrum. If I were you I would go with the Wuhan, since I’ve often seen them to sound at least as good as the Dream at a lower price. I was checking for a cymbal pack for my new Pearl Export drum kit. Zildjian Planet Z suited my needs but I am confused between 16″ crash and 18″ crash/ride. What would you prefer? Thanks for your question again! I’d always go for a hihat + crash (between 14″ and 16″) + ride cymbal (btw 18″ and 20″) for a new kit. I’m not sure what’s included in the package you’re talking about or whether you’Re looking to buy those cymbals individually – but this would be my ideal scenario. Thanks, Celsa, I appreciate it! Could you please suggest me a pack of cymbals which have fuller and darker sound.. I am pretty much confused which to buy.. I like the sound of sabian b8x and zildjian k custom. But k custom is too much costly. Well i don’t want to spend tht much money. Sabian is good. But can i get better than sabian in tht price range? Please throw some knowledge.. Thanks for your question. 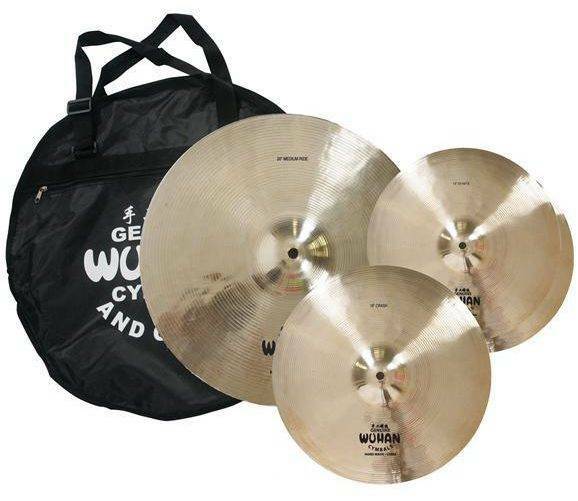 How about the Wuhan cymbal pack? They sound pretty full and dark. I got one question man, im planning to play rock and maybe some metal in the future… so do you recommend the Wuhan or the Dream cymbals ? Thanks for your question and your kind words. I appreciate them! For rock, I think the Wuhand and Dream cymbals both do a very good job (because both have a “rich” and “dark” sound as they are made of B20 bronze). And since the Wuhan are cheaper and have done the job just as well as the Dream for me, I recommend you go with them.